1. What are the direct costs – financial as well as human – of FGM? Who pays the most? And who benefits the most? Are these costs (and ‘benefits’) the same in all practising communities? 2. What wider costs, beyond the personal, are incurred by FGM-practising communities? Are there any genuine ‘benefits’ and, if so, how otherwise if necessary (?) might they be secured? 5. Who makes decisions about FGM etc at the level of policy and legislation? Is this the same in all communities? How can evidence that FGM is harmful – and wrong – be leveraged in the context of competing political interests? 6. What are the resource demands of eradication? And what else regarding resources must be considered, to translate the imperative of #EndFGM into policy and practice? In summary, we continue to develop the themes around economics which have exercised some of us for quite a while now. The advice ‘follow the money’ remains as central as ever, as we seek to find ways to make FGM history, see e.g. The 4 ‘E’s Of FGM Eradication – My Paper On The Economics Of FGM, At The UN Geneva IAC Meeting. • When in Lagos, Nigeria, in 1998, Joy Keshi Walker conceived of an art exhibition against FGM, she called it ‘The Suffering, The Sorrow, the Setback’ whereby ‘setback’ referred to the economics of wounding a substantial portion of the population, thereby reducing their productivity, limiting their contribution to GDP and elevating healthcare costs, not to mention the price in pain and anguish of the injured. Analysis at this macrolevel is rare, though business consultants can calculate the cost in a given economy, knowledge that is urgently needed. • Similarly, analyses of vested interests are scarce. One exception is Diana Kuring’s detailed study of Eritrea’s nine ethnic groups including the expense of celebrations and fees charged by ‘FGM enthusiasts’, excisers and traditional birth attendants (TBAs) whose personal and economic interest is central. ‘Society grants them respect and approves their activity’, the reason they believe that what they do ‘”is good for the girls”.’ Even after sensitivity training, few acknowledge health risks, an attitude ensuring their own social status and income. Prestige and living standard are similarly twinned in other practicing groups. Let’s cross the Sahara. In Sierra Leone Kadidiatu Suma, who had been taunted for being a ‘burka’ – uncut – is forced by her grandmother when in her mid-teens to suffer the cut. So great is her anguish that she makes fighting the “rite” her life’s work, but her approach is soft. As an initiate herself, she can hold candid talks with Sowies – ‘many see it as a business’ — who are defiant in their conviction, like the TBAs and cutters in the Horn of Africa, that their elevated status derives from a beneficial social service only incidentally supplying ‘a good income’. Only when Kadidiatu proposes an alternative source of cash does the Sowie whom she has drawn aside grow thoughtfully silent. “Would you then give up this work?’ Kadi asks. Although hesitant, she says, ‘yes’. 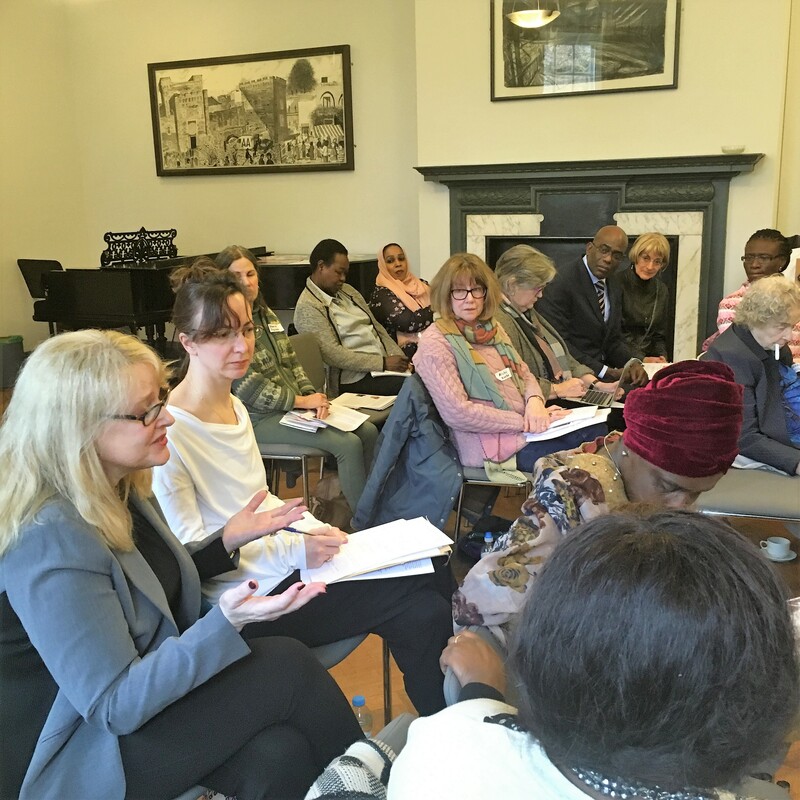 • In addition to cutters’ earnings, ‘the idea that FGM has [broader] economic implications is not new’, as Hilary Burrage pointed out at our last workshop. Bride price is often tied to FGM, the cut girl considered of higher value so that her father receives more from a prospective groom. 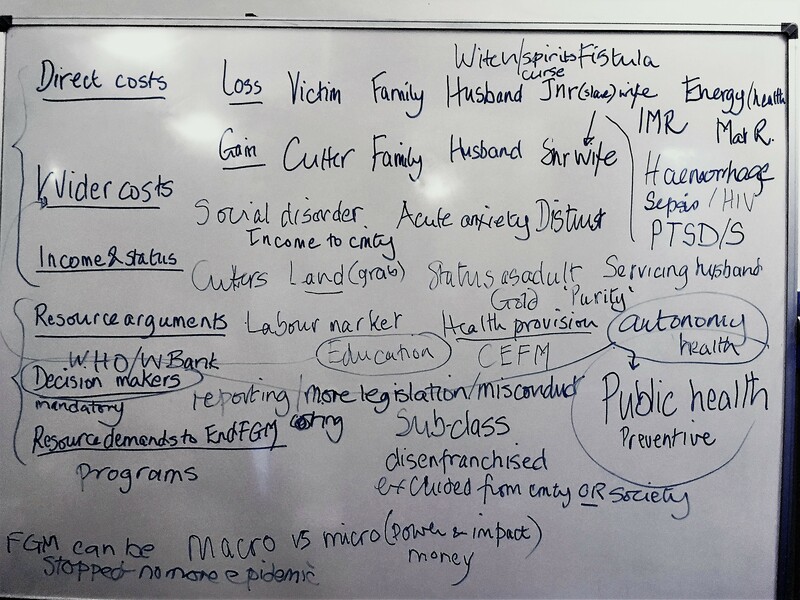 ‘Patriarchy as an institution supports these practices’ Burrage adds, with significant fiscal impact on communities, and she recommends increased attention to ‘the results of inflicting harm on women and girls whose health might otherwise be better’. The challenges of eradicating FGM are fundamentally economic, but they are also very fundamentally concerned with human rights. The personal is political in a very meaningful way when we consider FGM and other harmful traditional (or indeed current) practices (HTPs). Please post them in the box which follows these announcements.